You've reached this page because you were looking for the Easi-8 remote control, formerly made by Wit, Inc. The Easi-8 has been out of production since 2009 when the company making the product closed its doors. The support website has been inactive since 2010. For Easi-8 users seeking instructions on using the Easi-8, you can download the instruction manual here. We do not sell, service or support the Easi-8, nor do we have parts for it. The technical manual is here as a convenience to Easi-8 users, but we have no association with the former Wit, Inc or the defunct Easi-8 remote control. If you're looking for a new remote control with Internet and telephone support, you may want to consider the CircuitWerkes Sicon-8. For a simple Internet only remote control, we also offer the SiteSentry2. A special lite version of the main page is also available for mobile (PDA) based browsing. The PDA page gives you all of the basic metering, control and alarm handling in a simplified and compact format. The Sicon-8 is a modestly-priced, but full-featured dial-up remote control with speech capability. Based on voice recording technology, the Sicon-8 can speak in your staff's language because you record your own messages. The Sicon-8 was designed to be a complete solution for facilities with basic to moderate control requirements. All of the I/O, including 8 channels of relays, are included on the main board so there is no need to buy anything else to use the product. All metering, status and control connections are on depluggable screw terminals. An expander chassis, the SX-8, adds eight channels of metering, status & control to an existing Sicon-8. Up to three SX-8s may be added to a Sicon-8 for a maximum of 32 channels. Designed to be controlled from the onboard Ethernet interface, any dial-up telephone, an auto-answer cell phone or its serial port, the Sicon-8 gives you the control options that you need. The onboard Web server gives access to all of the Sicon-8's metering, Status & basic control functions & supports several simultaneous users with 4 different access levels. The Web server requires no software other than a Java capable Web browser to operate and works on multiple operating systems and browsers. The dial-up control is based on proprietary voice recording technology that lets you record your own messages, in any language, and is smoother sounding than most other voice recording technologies. Choosing the right remote control for your operation is a big decision. The wrong choice can be expensive in many ways. We've created a downloadable comparison template that you can use to compare our Sicon-8 to other brands. The PDF can be downloaded here. You've been asking for years! Now there is a new remote control designed to fit your needs AND your budget! > Speaks every language in the world because you record your own messages. > Dial-up, site controller with balanced audio pass through and 8 channels of metering, status and control. Has up to 5 alarms per channel. > Optional 8-channel expansion module gives you up to 32 total channels. > All connections are on depluggable screw terminals right on the main chassis. No additional panels are needed for operation. > Free Windows interface program with multi-site capability lets you setup or monitor/log the Sicon-8 (but is not required for standard operation). > Basic time of day/date automation (event scheduler) functions are built-in. > Web Server/Ethernet interface lets you control the Sicon-8 over your network or the Internet. > When controlling via Webserver, the applet or Sicontroller software alerts you if the network fails & tries to auto-reconnect. > Supports simultaneous users from telephone, Web & serial / USB. All control & metering functions are available to everyone. The Webserver also supports up to 10 simultaneous users by itself. > Cell phone audio interface lets you use the Sicon-8 with any auto-answer wireless phone. Great for sites with no phone service! relays are on easily replaced daughter boards. > Uses heavy 5 Amp, SPDT relays on channels 1-6 for maximum flexibility. > 1 Amp, DPDT relays on channels 7 & 8 can be programmed for latching or momentary. > Pre-programmed for English (Spanish on request) & is easily re-recorded. A detailed PDF datasheet for the Sicon-8 can be downloaded here. The Sicon-8 software can connect to your Sicon-8 via serial port, Web server or modem. Multi-site capability lets you monitor multiple sites from a central location. Software also makes setup a snap, but the Sicon-8 is fully functional even without the software. Want to peek under the hood of the Sicon-8 to see why we think this is the most reliable remote control ever built? Click here for the inside tour. The onboard Web server duplicates much of the Sicontroller software's control functions and runs on any Java capable browser. As shown below, the Web server is designed to be uncomplicated and will run on multiple platforms and browsers, provided that they are Java capable. It even works on the iPhone's Safari browser. 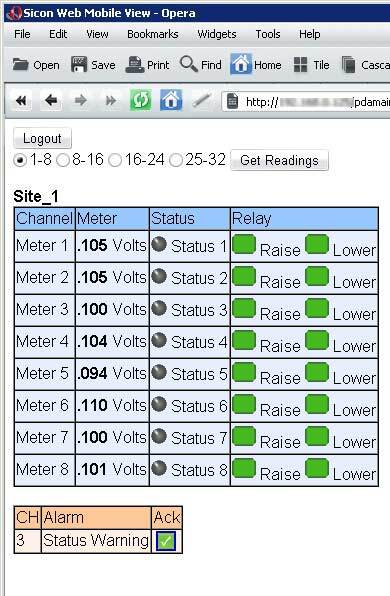 Meters are updated aproximately every two seconds and the Web server shows the current meter values, channel status and alarms. Reader - Can not operate any controls. All controls are hidden from readers. Administrator - Has access to all functions, except top level password changes. Super-Administrator - Similar to the administrator, the Super-Admin is the only one that can change their own password. This user level is designed to protect owners from being locked out of the Sicon-8. Note: Information presented represents the best available at the time of publication. The Sicon-8 specifications or features may change without notice.